While it doesn't totally demystify music theory, AutoTheory does make it easier to produce harmonically-pleasant tunes. Broad appeal, from beginner to pro. Highly configurable. 'Strum mode' emulates guitar strumming. Helpful online documentation. Clean, uncluttered GUI. Initial setup can be fiddly. Debuting in late 2013 as a Rack Extension for Reason, Mozaic Beats' AutoTheory is now available as a standalone app for PC and Mac. A 'MIDI mapper' designed to make it easy to create quality compositions, it intercepts MIDI data from your keyboard and passes it to your DAW's MIDI inputs in the form of chords and melodies based on your chosen key and scale. "It's essentially a more configurable take on the 'key/scale locking' features found in systems like Ableton Push "
It's essentially a more configurable take on the 'key/scale locking' features found in systems like Ableton Push and Arturia BeatStep. Since it acts as a conduit between your MIDI keyboard and your DAW, the developers recommend disabling the former completely within the latter before launching it. Some DAWs make this easier than others, but there's plenty of info on the Mozaic Beats website to assist you. Along the top of the interface are controls for selecting your base key and scale, together with a mapping selector that determines how the keys you play are reassigned to new notes. Below these is the Chord Generator, which produces harmonically correct chord shapes dependent on the selected key, through the user holding down single white keys. To its right, the Melody Lock remaps your played-in melodies (just hit keys at random, if you like!) so that they conform to the currently selected scale. 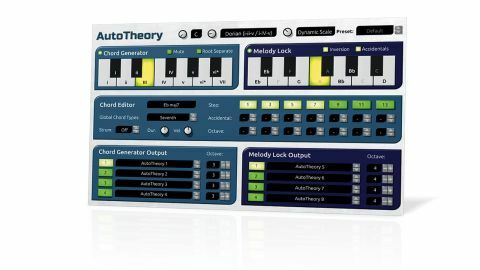 AutoTheory effectively splits your keyboard into two halves - the lower keys control the Chord Generator, while the upper half takes care of the Melody Lock. Both Chord Generator and Melody Lock also boast virtual keyboards that can be clicked or played from your QWERTY keyboard. The central third of the interface comprises the Chord Editor, where you tailor the shape of the generated chords between normal triads, inverted triads and four different flavours of seventh chord. There's also a Strum mode to emulate guitar strumming, with controls for adjusting strum duration and velocity. A further set of buttons to the right can be used to add extensions in the form of sevenths, ninths, 11ths and 13ths, and you can set the octave for each individual note in the chord, as well as nudge them up or down a semitone. The lower third of the interface determines which of AutoTheory's eight output channels transmits the data generated by the Chord Generator and Melody Lock. These can then be assigned as MIDI inputs for your DAW's software instrument channels. "Since the Melody Lock dynamically reassigns the keys on your keyboard, you can be confident of your input always fitting the chord"
Once configured, you're free to improvise away, changing chords with a single finger of your left hand and noodling away on the melody with your right. Since the Melody Lock dynamically reassigns the keys on your keyboard, you can be confident of your input always fitting the chord supplied by the Chord Generator. If you actually know how to play keyboard 'properly', it can initially be a bit disconcerting going for an E to find it's become an E♭; but after a while, you start to pick out melodies and chord progressions that you wouldn't have come up with otherwise. The app provides a musical safety net by making it harder to get things wrong, so you find yourself punching way above your compositional weight. AutoTheory is a useful tool for pointing the way forward when you're stuck for a chord progression or melody, and a comfy gateway to the world of music theory. Whether you're an experienced keysmith or a total beginner, it really does pave the way towards composing better, more structurally sound music.